Our fleet of vehicles comprises the latest models from the Ford Transit brand (max. 8 seats) with ABS, airbags, the latest engines, electronic limited slip differential, a secure passenger compartment and three point seatbelts on all seats. We also offer the Ford s-max (max. 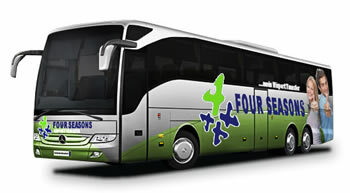 4 seats) for smaller groups and modern 19, 30, 50 and 58-seater coaches. The vehicles within our fleet are, on average, 9 months old and meet all the latest technical standards. Regular maintenance and repair work is carried out by an official Ford garage, thereby ensuring that our vehicles are always of a perfect standard. To ensure that the transfer is as comfortable for you as possible, our vehicles come with air-conditioning and independent heating. Guests are provided with chilled mineral water and newspapers free-of-charge during the journey. 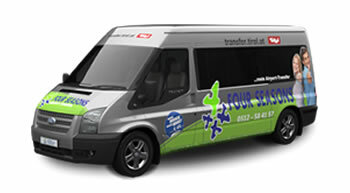 The Ford Transit is the vehicle used most in our shuttle service. This people carrier offers passengers plenty of space and comfort and the highest level of safety. Its car-like characteristics offer competent and accurate manoeuvring at all times. The technical efficiency ensures that guests enjoy a reliable and relaxing journey to their end destination. 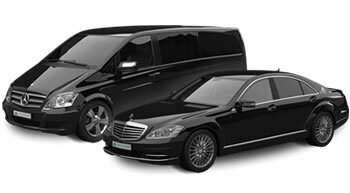 During the peak season, up to 40 vehicles form part of our fleet and we also work with carefully selected partners during this time to ensure that we are able to cover all the booked transfers without any difficulty and we can offer modern 19, 30, 50 and 58-seater coaches.